Native from Carcassonne, in the heart of the biggest vineyard of the World, Jean-Rémi Mourad is from a winegrower’s family, his father is from Bekaa Valley in Lebanon, one of the oldest vineyards, and his mother’s family was winemakers in Languedoc. After studying biology and oenology (Master), Jean-Rémi Mourad ended by a speciality on Mediterranean plants and soils. also in foreign countries, he has been working in wineries, laboratory, chamber of Agriculture, before creating is own company Fontemour Intl. in 2007. In term of prices, our target is from popular premium to Icon. (1,6 to >5eur exw) and we also developed strong partnerships in Bordeaux area, with famous domaines and Chateaux, including Grands crus classes, we have allocations on the best Chateaux each year for our customers. We are also able to adapt special brands for our customers, like exclusive wines, or home wines, and we also propose selections of exclusive little wineries. 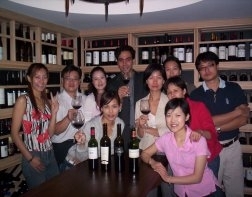 Our other activity is bringing full support to young starting wineries in the Asian market. A strong presence in the Asian area, about 4 to 6 times per year, in order to find new importers for our partners, and consolidate existing relations with our clients. We mainly work with French wineries, but we also have some suppliers from Italy and Spain, and we are open minded for study some new partnership with wineries from others European areas. Don't hesitate to contact us if you are interested to know more about our exports solutions, or for any inquiry or wine searche, we will answer you immediately.